Recently a much-loved member of our family passed away. She decided that she didn’t want a traditional funeral, but preferred to have friends and family gather in her home to celebrate a life well-lived. Family and friends came from near and far to pay tribute. Usually at a funeral someone gives a eulogy to honour the deceased. In this case, there was no funeral, so perhaps it would be appropriate to write a eulogy. Pierrette Laurence Valiquette was born in the small town of La Minerve, Quebec, in the northern Laurentian Mountains, on October 20th, 1932, when the leaves were probably ablaze with dazzling autumn colours. She was one of six children of Laurence Bruneau and Philippe Valiquette. The family moved to Outremont and Pierrette began working as a pattern maker. Her employer soon realized she had artistic talent. He sent her to New York City where she gathered information about the latest fashions. Her work was awarded first place in one of the local fashion design competitions. Her marriage to my brother, John, took place in the Sacred Heart Chapel of Notre-Dame Basilica in Montreal on January 30th, 1960. It is interesting to note that most marriages took place in the chapel because the long walk down the aisle in the Basilica made young brides too nervous. The couple started a family while John studied to be a chartered accountant. His career took the family away from Montreal, but it didn’t matter whether they were in Toronto, Calgary or Edmonton, Pierrette always adapted to her environment. She continued to sketch and paint. When Pierrette and John returned east the family was delighted. They settled in Perth, Ontario, a heritage town just beyond Ottawa, much closer to the rest of the family. 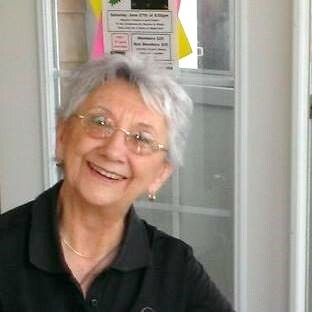 Pierrette learned to play golf, something she continued to enjoy all of her adult life. She also was a member of the Raging Grannies, a golden-age protest group. She was determined to stop smoking. She attended Smoke Enders and later became a spokesperson for the cause. At Christmas one year she joined a group of bell-ringers. Pierrette was a member of several art associations in and around Perth. She participated in countless local exhibitions. Although her family came first, she nurtured her passion in art in its many forms. She would sketch people, create pen and ink drawings of local scenes. Acrylics were most likely her favourite medium. “Pitou” as John called her, painted beautiful scenes of the rolling hills of the Charlevoix area beyond Quebec City on the north shore of the St. Lawrence River. When my sister-in-law was widowed at the age of 67, she decided to travel and pursue her art. One summer she went to Giverny, France, home to the Impressionist Monet, to study. Another year, it was a trip to Florence, Italy to study the Masters. Other summers, she and some of her artist friends stayed closer to home. They went to Baie St. Paul, a beautiful part of Quebec. There she would truly be in her element. In her home, the studio and kitchen were her favourite places. She was a good cook and she often had her father-in-law over for a meal. She would hand him his plate and say “Leave what you like” and he who loved to play on words would respond, “Eat what I don’t like?” There was never anything left on his plate at the end of the meal. He liked to tease her. She would give him a big smile. We will miss Pierrette: her laughter, her smile, her talents, her compassion and kindness. She was a good wife, mother, friend and sister-in-law. We are all better off for having had her in our lives. Notes: During the celebration in her home, family and friends were treated to an exhibition of many of her works.